Members enjoy this discounted rate. Consider becoming a DGCEC member! You will find the form posted under the membership tab on the website's home page, or pick one up at the center. This fee helps support the running of the center in addition to making possible a wonderful lunch. 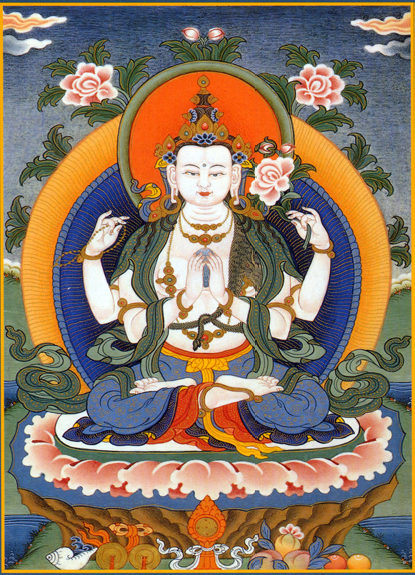 Chenrezig (Avalokiteshvara) is the Bodhisattva of Compassion. A bodhisattva is an enlightened being who delays becoming a fully enlightened Buddha, instead living in a compassionate spirit life for the sake of all beings. With a mantra, Om mani padme hum! (Hail the jewel in the lotus), the bodhisattva tirelessly attempts to deliver all beings from suffering. Chenrezig appears in many different forms to assist suffering beings. Tibetans believe that Chenrezig, as a disciple of the Buddha, made a vow of compassion to free the Tibetan peoples from their violent ways. He is the patron of Tibet. The Tibetan people claim descent from Chenrezig. He has been identified with the Tibetan emperor Songtsen Gampo (617-698 C.E.) and with the successive lineage of Dalai Lamas. The 14th Dalai Lama, Tenzin Gyatso, is the current incarnation of Chenrezig. Compassion is the most important religious practice. For Tibetan Buddhists, compassion is sensitivity to the sufferings of others and attempt to relieve suffering. It is the realization that we (human beings, animals, and the earth itself) are all interconnected. Love and compassion are the true signs revealing the presence of Chenrezig. The Buddha is a supreme example of compassion, for he taught human beings the way to freedom. Join us for this opportunity to deepen your practice when Geshe Kalsang Rapgyal offers this special retreat at DGCEC. There will be four teaching/practice sessions with breaks between. Partial scholarships are available. To make your request, please email DrepungGomangCompassion@gmail.com.